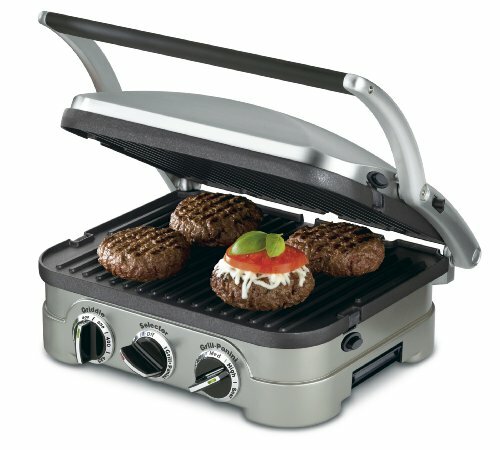 The Cuisinart GR-4N 5-in-1 Griddler is the top choice, thanks to the 5-in-1 design. 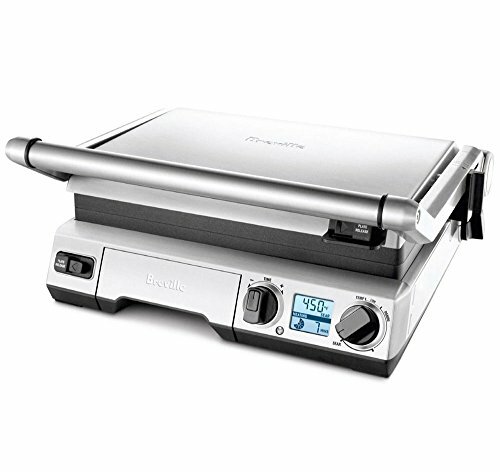 You get a full grill, griddle, panini press, half grill/half griddle, and contact grill. This gives you much more freedom to cook different styles of food with the same grilling unit…while indoors! The two removable plates can be detached with the push of a button. It also comes with a cleaning tool that can be used to scrape between the grill surface to get the hard-to-reach areas. Compared to a majority of electric grills for indoors, this grill heats significantly quicker and reaches hotter temperatures. The grill has temperature control knobs and indicator lights. The lights let you know when the grill is ready to cook. This 5-in-1 appliance also has a durable stainless-steel finish. With proper care, this device should offer years of use. With the 5 cooking methods, it will also likely become one of your favorite appliances. This compact indoor grill is simple, convenient, and fast. The GRP1060B is another efficient indoor grill from the recognizable George Foreman brand, but it can heat up about 35% faster than other George Foreman models. 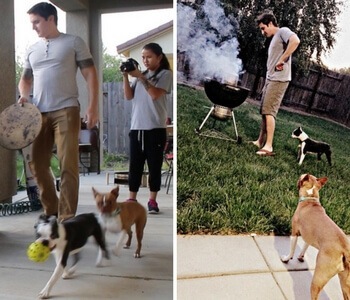 The grill comes in two colors – black and platinum. You'll likely notice the George Foreman signature logo below the indicator light. The light is red when the grill is heating and then changes to green when you can start cooking. The grill is relatively small, but can cook about 4 burgers at once. Luckily, you can keep cooking additional servings without dealing with an unstable heat source – such as charcoal or wood. The two removable plates are dishwasher-friendly, making it easy to remove the food particles. Other advantages include the price and the durability. Despite the low price tag, this grill shouldn't break down easily. The Hamilton Beach 25360 indoor grill comes in two versions: one with a stainless steel lid and a second version with a window right in the middle of the lid to watch the meat cook. The temperature controls are fairly easy to use. All you have to do is slightly turn the knob, and depending on what direction you turn, the temperature will increase or decrease. The nonstick removable plate, the lid, and the drip tray are all dishwasher safe, which simplifies the clean up process. Simply dump the grease from the tray and place in the dishwasher. No need to waste time hand washing your plate when the dishwasher can do it for you! While stainless steel is pretty durable compared to other materials used for grills, there will be times where it accumulates fingerprints and other random marks. By having a lid that’s dishwasher safe, you can keep your indoor grill looking brand new. The CG702 OptiGrill indoor electric grill has plenty of options to meet your needs. You will find this grill in two sizes: 4 servings and 8 servings. The amount of people you typically cook for will likely determine the size you decide to go with. This grill includes 6 different automatic cooking programs for burger, poultry, sandwich, red meat, fish, and sausage; the settings determine the temperature, which is automatically set. The preheating indicators will signal to the user that the grill is ready to cook, as well as when the meat hits rare, medium, and well-done temperatures. This will help beginners learn how to cook their meat at different levels. In addition to 6 cooking programs, there are 2 cooking modes that are meant for different types of foods. One mode is for frozen food, while the other is a manual mode that puts you in control. This is very useful for frozen foods because you won’t have to wait for your meat to defrost in order to cook it properly. Cleaning afterwards will be a breeze thanks to the two dishwasher safe removable nonstick plates. If you think having an indoor grill is convenient, try having a smart grill. The Breville smart grill has a 1800-watt heating element that will cook your food quickly. The temperature will vary depending on what mode you use: low, panini, or sear. The average temperature measurement when used in these modes is roughly 310 to 450-degrees Fahrenheit, which is more than enough heating power to cook meat thoroughly. This unit has a small orange screen in the middle of two knobs; one used as a timer, the other for temperature control. The screen displays the exact temperature as well as the minutes left on the timer. This makes it very easy to keep track of how hot the grill is and how much longer you’ll need to cook your food. A disadvantage to this grill is the price. This grill is by far the most expensive grill on the list. Some people also claim that this grill doesn’t always cook food evenly, something that can become annoying after a while, but if you use the press while cooking and keep your eye on the temperature gauge, you shouldn’t run into this issue. Selecting the grill for you depends on a few things, including how experienced you are with grilling, if you want to cook a variety of foods, and your willingness to clean. What you should usually look for is: easy accessibility to the cooking plates, easy temperature controls, and plates that can be used in more than one way. 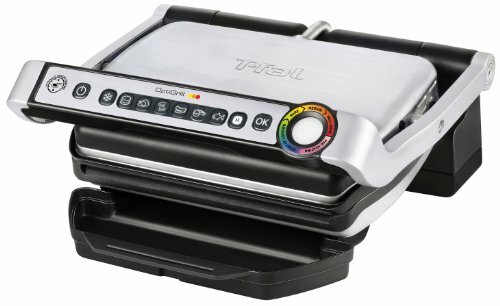 The T-fal OptiGrill is a great beginner’s grill, primarily because of the heating guide it has for cooking meat. This grill will walk you through the cooking cycle, allowing you to cook your meat anywhere from rare to well done. By using this grill, you’ll be able to get an idea of how long you will need to cook a piece of steak to get it to medium rare. When looking for a long term grill, especially one that makes excellent paninis, the Cuisinart GR-4N Griddler will deliver. This grill has the durability needed for long term use, as well as the tools required to make a variety of food and clean up properly. 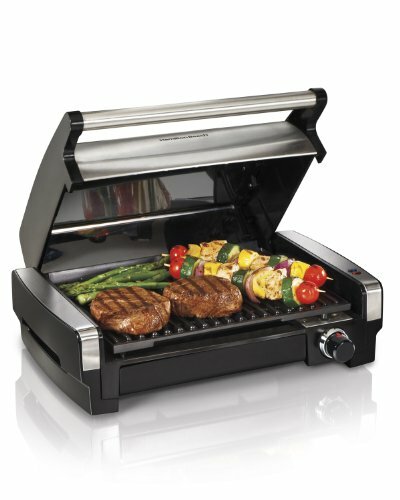 This indoor grill also heats up faster than most other grills, so you won’t have to wait long to get things started. 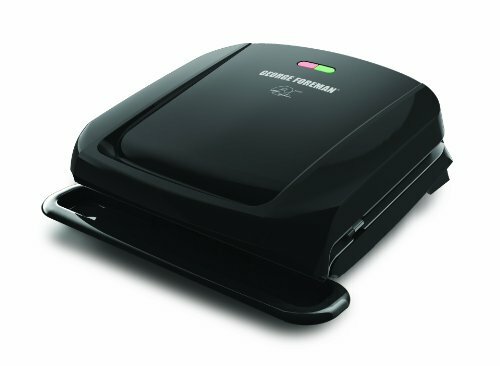 In addition to the GR-4N Griddler, those who are looking for a slightly healthier cooking process will enjoy the Hamilton Beach indoor grill and the George Foreman 4 serving grill. The only reason you might have an issue with the George Foreman is because it lacks temperature controls. The Hamilton Beach Grill only has one cooking plate, but you’ll be able to gradually monitor the temperature for an even cook. These grills may cook smaller quantities of food, but at least they take out the grease from the meat and separate it. Also, remember that these grills are electric, which are great for outdoor cooking on apartment balconies with overhangs! Indoor grills that have removable plates will give you more freedom to cook your food how you want and they are typically easy to clean. After using a charcoal or gas grill, food residue or other particles will be present on the grates, demanding that you clean by hand almost immediately unless you want to scrub the grates until the end of time. The indoor grills with removable plates can be detached from the grill unit and placed in a dishwasher. All 5 of the grills on this list use electricity as a heating source. Other fuels, such as charcoal or gas, can become extremely dangerous to your environment if you’re indoors (gas grills are ok for open balconies). The bottom line is that indoor grills with removable plates give users more opportunities to cook different types of food and makes it much easier to clean up afterwards. No one wants to stick around the grill for over an hour cleaning, especially after they spent a significant amount of time cooking.